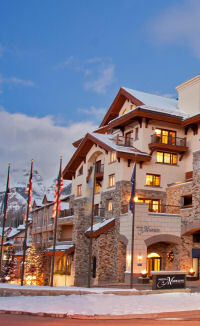 * Steps from over 100 Telluride ski trails. All space will be allocated as support is confirmed, with preference to Principal Sponsors. Format Artwork: High resolution PDF preferred. Artwork created by any of the following applications are accepted as well as any other program that produces the same type file formats: Adobe Illustrator, InDesign, Freehand, Photoshop. Cancellations received in writing prior to 31 December 2018 will be refunded all monies paid less expenses incurred. After this date no refunds will be made. The organisers reserve the right to cancel the exhibition due to events or circumstances beyond their control. All monies received will be refunded in full in this situation. Internet connections (wireless) are available to your stand space at Madeline Hotel and Residences. General site and access security will be provided for all exhibition by resort staff. Security of your exhibition site during the day is individual responsibility. Group discounted rates have been negotiated with Hotel Madeline. You must book your accommodation through Conference Matters on the registration form to receive the discounted rate. The Hotel will accept shipments no earlier than two (2) days prior to the arrival day of the convention. Shipment handling charges will apply. First 100 pounds of freight are handled at no charge. Anything over 100 pounds will be charged $50.00 per 100 pounds. Instructions: Use the + and - tool on the map to zoom in and out or left double click with your mouse to zoom in and right double click to zoom out. To move the map, drag your mouse the direction you would like to go. 'A' is the location of the conference hotel; Madeline Hotel and Residences. +All equipment/brochures must be picked up by 5pm Monday 25 February 2019. Any material still uncollected by this date will be deemed wanted and disposed of appropriately.